"Residents oppose proposed native laws"
OHSWEKEN - Some Six Nations members will do what they must to stop proposed federal legislation that would open the door to property taxes. "I'll go as far as I have to," said Allen MacNaughton, referring to stopping proposed legislation that would radically alter the power of elected band councils and pave the way for taxation on reserves. He was speaking to more than 125 people at the community hall in Ohsweken to go before the House of Commons this in June. 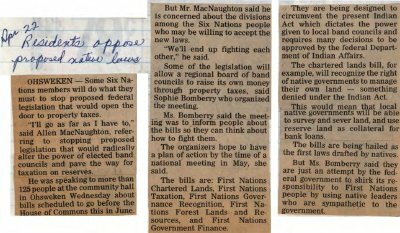 But Mr. MacNaughton said he is concerned about the divisions among the Six Nations people who may be willing to accept the new laws. "We'll end up fighting each other," he said. Some of the legislation will allow a regional board of band councils to raise its own money through property taxes, said Sophie Bomberry who organized the meeting. Ms. Bomberry said the meeting was to inform people about the bills so they can think about how to fight them. The organizers hope to have a plan of action by the time of a national meeting in May, she said. The bills are: First Nations Chartered Lands, First Nations Taxation, First Nations Governance Recognition, First Nations Forest Lands and Resources, and First Nations Government Finance. They are being designed to circumvent the present Indian Act which dictates the power given to local band councils and requires many decisions to be approved by the federal Department of Indian Affairs. The chartered lands bill, for example, will recognize the right of native governments to manage their own land - something denied under the Indian Act. This would mean that local native governments will be able to survey and sever land, and use reserve land as collateral for bank loans. The bills are being hailed as the first laws drafted by natives. But Ms. Bomberry said they are just an attempt by the federal government to shirk its responsibility to First Nations people by using native leaders who are sympathetic to the government. MacNaughton, Allen ; Bomberry, Sophie.